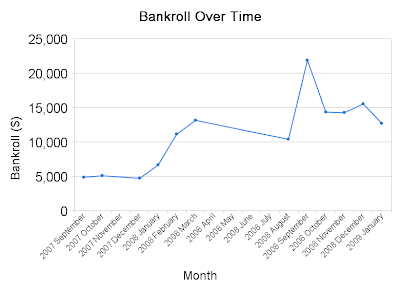 I’ve included stats and graphs for the poker I’ve played over the last year. I also discuss my [again] late New Year’s resolutions (along with a look at last year’s). 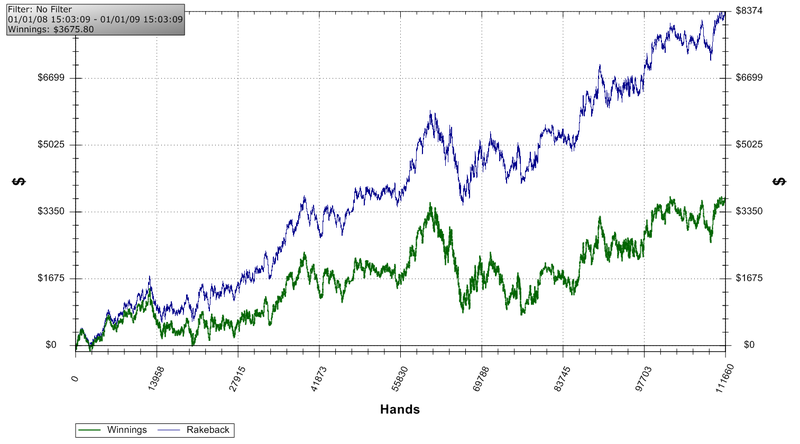 Here is my 2008 graph for all cash games (LHE/NL/PL) at Full Tilt. The green represents just table profit while blue represents profit including rakeback. A few things are depressing about the above. Firstly, I played less than 10k hands/month on average. If I was playing full-time (8 hrs/day), I’d be able to play the same amount of hands that I played all of last year in just one month. Secondly, I am still playing the same stakes that I was playing last year (whereas I moved up from $0.25/$0.50 to 3/6 and 5/10 in a few months). The upside to the above stats is that I could easily do this as a full-time job if I so choose after my Master’s. I’d be able to clear $4k-$5k/month if I played 100k hands and another $3k+ profit. That’s also assuming that I don’t improve at all (same winrate and not moving up in stakes at all). 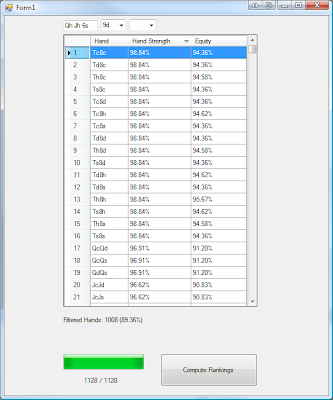 There’s a regular at my stakes (over 3/4 of his hands are at stakes that I play) whose played ~660k hands in the last 9 months (according to tableratings). He’s made ~$82k profit + ~$42k rakeback at a similar winrate to mine. 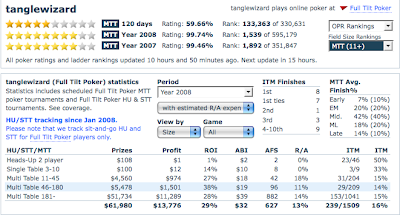 My average win rate was ~$24/hr (including rakeback) last year. For the last 6 months, it has been ~$30/hr. Notice that (even though it’s over a smallish sample size) I have a higher win rate by about 1/4BB and my average stats have changed from 27/19 -> 33/23. The 5c/10c was me shoving most hands at a $3 CAP game. If it wasn’t for me seeking out tougher regulars at deep stack $50 HU NL, the win rate would have been much better. Of course, none of that really matters since the sample size is so small. I recently sent my coach a link to a video of myself 4-tabling 3/6 6max LHE on FTP (with a sweet DeucesCracked table mod). If you’re interested, click here for the link (I can also email his comments on the video, if interested). Over this small sample size, it looks like I’ve become LAGgier preflop, I 3bet more, steal more. Something that I’ve really been trying to work on is bet/folding more on the turn and river. I’m also valuebetting thinner and not check/calling so much (along with check/folding more). This has done two things, I have a higher river AF and I have a higher W$SD (it’s 51.6% whereas it’s normally 49-50%). It’s pretty sweet that my rating is in the 99th percentile (and top 2000 players) for 2007 and 2008 even though I only played part-time during part of the year. I haven’t really played MTTs for a while because I needed a break after the brutal $5k or $6k+ downswing. Luckily it followed my biggest month. Also, I want to get back into LHE cash games. The reason why this month’s BR is lower than last months is because I’ve withdrawn $3k ($1k for Xmas and $2k for tuition since I used tuition money to buy plane tickets home to PEI). I really hate withdrawing from my roll all the time. This brings the total to ~$15k+ withdrawn. I’d almost be rolled for 15/30 had I never withdrawn. Oh well, I’ll just have to start logging more hands. Combining the cash game hands, rakeback, and MTTs, I made about $22k last year. I’m pretty happy with this considering I didn’t get to play too much (an average of 1 hr of cash games and 4 MTTs per day) while going to school (at least compared to a full-time grinder). Notice how it decreased almost linearly every month for the first half of the year. 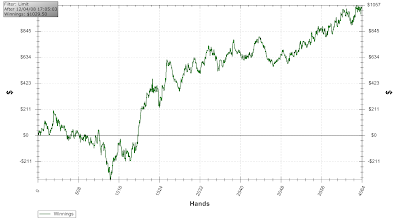 This is because I kept logging less and less hands (due to school, research, laziness, playing MTTs instead of cash). 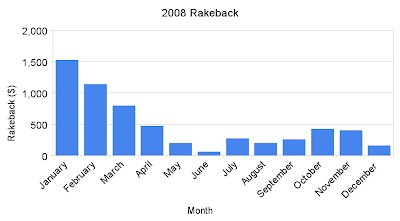 The most rakeback was ~$1500 a year ago (Jan 2008). I haven’t worked on the Preflop program I was describing in the previous blog entry. Instead, I started writing a new program. I originally started writing it in Java but it took a ridiculous amount of time to run. I then tried to figure out how to set up the Pokersource project but ended up giving up on that (their nice Java code was old, unused, and nonfunctional and I didn’t really wanna use their C stuff). Instead, I found the C# project that’s used by the Pokerazor guys. Of course, I didn’t know any C# but I decided to learn a bit of a new language, and hopefully come up with a faster way to computer what I wanted. I ended up with a primitive program that is much faster (but I still wish it was faster). I really like how easy it is to create a GUI. What it does: Given a board, it ranks every possible holding (hot-cold equity and current hand strength). These can then be sorted from highest to lowest or vice versa. There’s a huge list of things to add/change but I haven’t worked on it since before Xmas. For instance, I need to group equivalent/canonical hands together and be able to output ranges/subranges (e.g. top 50%) or compare equity of hands vs. another range or distribution. Okay, so I obviously lost the weight loss bet I had with my buddy for before Xmas. I kinda just gave up (although I was moving at a good rate for a while). However, he’s giving me a chance to redeem myself. Another 15 lbs /3 month weight-loss bet. If I win this one, I’m even, otherwise I owe him $100. I also have another $50 weight loss bet with a different friend; this one is for whoever can lose more weight than the other guy. That said, I’ve been making pretty major changes already. I’m drinking 8+ glasses of water a day, exercising every day (fitness room and squash), eating less, eating breakfast every day, eating healthier. Melissa and I also ordered a blender and a slow cooker today with our grocery store points. Today, I got a decent 1L water bottle and “My Weight Loss Coach” for the DS today. To top it all off, I’ve been reading a bit about exercise/nutrition (book, magazine, online) and asking others. I might even look into getting a personal trainer or someone to teach me proper gym techniques for a bit. Finally, I have something where I can implement my competitive drive (aside from poker). I’m going to crush you ______! (you know who you are). On a somewhat related note, I’ve also worked out a deal with Melissa. It’s a pretty win-win deal for both of us IMO. She wanted to go on a trip/vacation with some friends in a few months (with a budget of ~$800-$1k). I proposed that she cook a healthy meal for me every night (that she doesn’t work) and I’ll give her $800 (since I’ll have extra time to play poker) and we settled at $825. Both of us are pretty pumped about the deal. Below are last year’s goals/resolutions (from my old Cardrunners blog). I’ll use the standard 2p2 [x] vs. [ ] check boxes to denote whether I succeeded or not. [ ] Reduce my procrastination significantly (I am a very bad– or good, depending on how you look at it– procrastinator). Although I’ve done well (school-wise) in the past, I can’t really do that for my Master’s. [x] As mentioned in an earlier blog entry, I want to have a $10k bankroll online by April 4 (3 months from when we got back from our Xmas trip). [ ] Get into the top 100 on the tournament leader board (TLB on Full Tilt) for at least one month. [ ] Start playing and winning at NL 6max cash and SNGs as well as some more HU LHE and possible HU NL.